We love any excuse to eat dessert for breakfast. This recipe walks that fine line…is it carrot cake? Is it a breakfast pudding? All we know is that it’s delicious! Our recipe today was inspired by an 18th century recipe for “carrot pudding”. It was found in a cookbook called “A New and Easy Method of Cookery” by Elizabeth Cleland written in 1775. It’s possible that the folks living in Colonial Williamsburg may have enjoyed a version of this pudding during the spring months. While this recipe is mostly eggs and carrots (a true carrot pudding), we took that inspiration and updated it for a modern palate, perfect for our bed and breakfast guests to enjoy as a spring breakfast treat! Wanna give it a try? If you love carrot cake, you’re going to love this recipe! Start by preparing your bread. We chose french bread because it bakes soft, without getting soggy. However, if you prefer a softer, sweeter pudding, Challah or Brioche would be delicious choices, too. Slice your bread into 1/2 in cubes and allow to sit and dry out overnight. If you have stale bread in the house you don’t know what to do with, bread pudding is the perfect recipe! In a medium sauce pan, add heavy cream, butter, sugars, spices, salt, and grated carrots. Cook at medium heat until the sugar is dissolved and the carrots are slightly softened. Remove from the heat and allow to cool completely. This can be prepared in advance. When you are ready to assemble, grease your chosen baking dishes with non-stick spray or butter and preheat your oven. Place the bread cubes inside a bowl. Strain the softened carrots from the milk and add to the bread along with the toasted pecans. Mix to combine and add to the baking dish(es), trying to keep the carrots and pecans evenly distributed. Prepare the custard by beating the eggs in a bowl until completely homogeneous. Add the eggs to the spiced milk mixture and combine thoroughly. Pour this mixture over the bread cubes slowly, allowing the bread to soak up the custard. Allow the bread to sit for at least 30 minutes, adding more custard as it is absorbed. The bread should look moist, but there should not be much custard sitting in the dish. Top the bread pudding with the candied pecans. Place in the oven. If using single serve ramekins, bake at 375° F for 20 – 25 minutes, until puffed up and golden brown. If using a large baking dish, bake at 350° F for 45 – 50 minutes. While baking, assemble your glaze. In a mixing bowl, combine cream cheese and powdered sugar. Add vanilla and salt. Slowly add in the orange juice until the glaze is the consistency that you desire. We estimated 1/4 cup, however this will depend on your desired consistency. If you like a very thick glaze, add less, if thin, add more. **We added the orange juice and zest to stay authentic to the original 18th century recipe, but you can change this to fit your own palate. Pineapple juice, lemon juice, or other flavored liqueurs are great options. 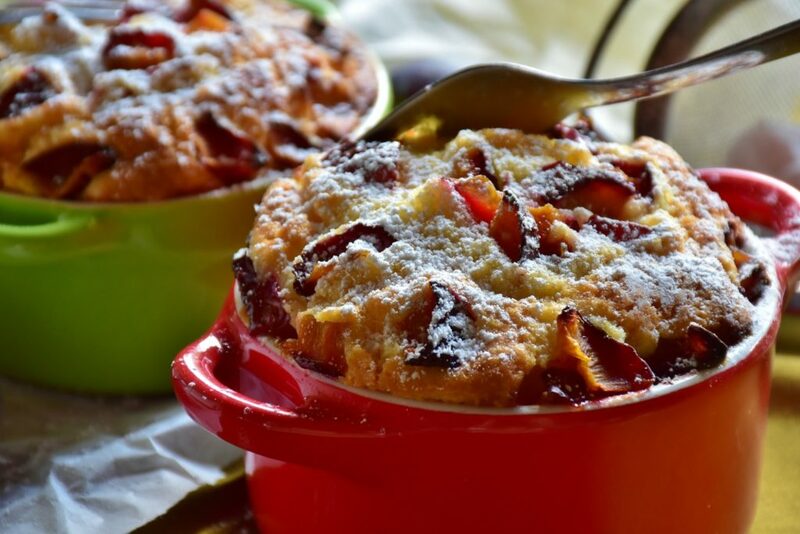 Remove finished bread pudding from the oven and serve immediately! Do you think you’ll try this Colonial Williamsburg Inspired Carrot Cake Breakfast Bread Pudding recipe? This entry was posted in Food, Recipes and tagged bread pudding, breakfast, Carrot Cake, Colonial Williamsburg, recipe, Spring by joy. Bookmark the permalink.